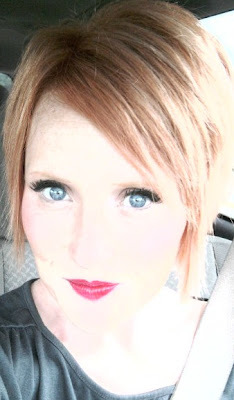 On the 'Raising Redheads Blog' facebook page not long ago I had a friend ask me how I'm able to maintain my workout routine while raising the kids, homeschooling them, doing therapies with Mabel, making Dr's appointments, being a wife, maintaining friendships and everything else that comes my way each day. It's quite simple. I've always said it. You make time for what is important to you. And this, my friends, is important to me. It's not to say that it's not difficult to find the time or that it doesn't make me feel guilty when I'm on the treadmill for a half hour and I could be reading to Nora. But it's vital for me. I'm not working out or making it a priority because of my weight.. I'm working out because of my sanity. Of course I want to feel good physically and I want to feel like I look good as well. We all know the benefits of exercise but one of the greatest benefits for me is the endorphins that are released around mile 2.5. Some days they are remarkably thrilling and exhilarating. Some days they cause me to cry in hysteria as I continue running and release all of the sadness and frustration from the previous days. Exercise is hidden into every one's day. I just happen to find it, embrace it and enhance it wherever I can. I break dance in the kitchen while I'm making quesadillas for lunch [true.] I do stretches as I'm overlooking the kids writing their letter of the day at the table. I lay on the living room floor and do pilates while Mabel lays next to me tapping her drum or late at night when the kids are having rest time upstairs. I take each individual pile of clothes upstairs rather than putting them all into one basket and making one trip. I try to look at cleaning the toy room as burning extra calories. And I get on the treadmill whenever there is an extra half hour. Typically, it's when the smallest kids are having naps around 1:30 pm and Nora is doing her reading on the computer. When Daniel is home and I can, I try to run outside, no matter how cold, so I don't get a treadmill burn out. But the bottom line is this: I just don't make excuses. There IS time in my day to work out. There IS time in your day as well and you probably know it. It's that 15 minutes you spend on pinterest or sitting down to catch up on your DVR. It's that time when you are painting your nails late at night so you can wind down when you could be sweating off an extra 600 calories. You have the time but you probably also have the excuses. I have said a thousand times this year that everything about me has changed during this process with Mabel. But this is the one thing that has not. I love fitness and I will find time to be active whenever I can. It used to be for vanity and now it's for my sanity. Simple as that. Mama loves a good challenge so when I step on that treadmill I become different person. I push myself everyday to do something just a little bit different than the day before. And because of my very 'red' personality, I tend to take things a little bit over the top. Like I won't wanna stop until I run those 5 miles in 40 minutes and if I don't make it,--never mind...there's no way I'm not making it. But that's not why I'm writing about this today. I'm writing because a lot of you used to write me almost daily about fitness and exercise. I loved that! You had questions and I tried hard to give you the best answers that I could to those questions. This aspect of who I am hasn't changed at all, in fact, I believe it has only been enhanced by the challenges of the year. I have had to dig to a much deeper place to find sanity and to avoid therapy and I've found it in daily workouts that make me feel like I'm accomplishing big things. Because I am. I'm ensuring myself a long, healthy life. "But I have a baby! I don't have time to work out!" --that's a lie and you know it. I have 3. And I meet their every need and still find time for me. And you better find time too or else you won't be the best for that baby that you can be. Start out by laying on your side while the baby is in the exersaucer and do some side leg lifts. Prop your hand on your head. Point your toes on the way up, and flex them coming down (slowly). Do 8 of them, and then 10, and then 12. Work up to it if you have to. While you're on that side you can also do leg circles. Take your leg up in the air and then do 8 rotations to the front and then 8 to the back. And then go back to the front and do 10, and then 12. Work up to it! Another thing you can do is inner leg lifts and circles. While you're still on the same side, take your top leg and cross it over onto the floor in front of you. Slowly lift and lower your bottom leg. Do reps of 8, 10 and 12. This will be harder but it is a great workout for your inner thigh!!! You can also do smaller, slower leg circles with that bottom leg. They're hard but effective. Try it! In twenty minutes while your baby was entertaining him or herself, you just worked out your legs and although you feel it, it wasn't difficult. Whenever I find a few minutes, I'm on the floor doing some sort of crazy leg move [just ask Rache.] So you can too!!! I don't have a dishwasher so while I'm doing dishes, I'm usually also doing some sort of toe raises, which are great for your calves. While you're waiting for your toast to pop out of the toaster, do a couple squats, or plie's. Do you see? It's not quite so hard after all. Now admittedly I am a little over the top. I have never been able to control my body and just be still. So while Jeni & Rache are sitting on the couch watching the Kardashians, I'm usually on the floor in front of them squeezing my buns. But you don't have to be so motivated. Just get in a few minutes of something each day. Remember how important cardio is! 30 minutes a day is pretty vital and it is extremely possible. I know you're thinking, "not everyone has a treadmill." That's true. I didn't until a few months ago. But I still went into the toy room or the garage and did jumping jacks or leg kicks. And you can too. Not a big secret, right? Anyway, this post was all over the place and I know it. I just wanted to try and get a few tips out there that may help in the next couple of weeks. If you leave me a comment or a question, I'll try to respond as soon as possible. Please feel free to start/join the conversation on our facebook page. Thank you Ramee!! This was very informative, helpful and most of all motivating!!! I love you!